Perched high on the top of Hathorne Hill in what was once the village of Salem, Danvers State Insane Asylum was, for more than a century, a monument to modern psychiatry and the myriad advances in mental health treatment. From the time it opened its doors in 1878 until they were shuttered for good in 1992, the asylum represented decades of reform, the physical embodiment of the heroic visions of Dorothea Dix and Thomas Story Kirkbride. It would stand abandoned until 2005, when demolition began. Along with a dedicated group of private citizens, the Danvers Historical Society fought to preserve the Kirkbride structure, an effort that would result in the reuse of the administration building and two additional wings. Danvers has earned a unique place in history; the shell of the original Kirkbride building still stands overlooking the town. Though it has been changed drastically, the asylum's story continues as do efforts to memorialize it. 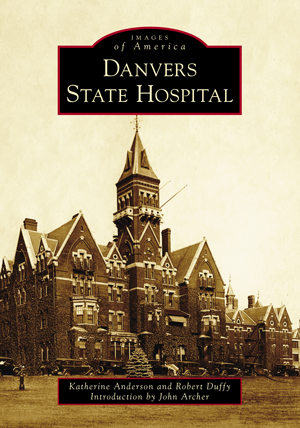 Katherine Anderson and Robert Duffy have spent the past decade documenting asylums in both print and media, working to continue the legacy of Dr. Kirkbride and the many men and women who lived and worked at Danvers State Hospital.